On June 4, we opened The Tech Virtual Test Zone, a new 2000 sq ft gallery at The Tech Museum of Innovation featuring exhibits on the theme of art, film, and music that were originally developed in Second Life by a community of creative amateurs. I was the project manager/curator for the exhibition, leading both the Second Life-based community exhibit design process and the real world translation of virtual exhibits. Now that the dust has cleared and the kids are banging on the exhibits (and showing us what we have to change next), I have the time to step back and share some of the lessons learned from this experience. On many levels, The Tech Virtual experiment was a success. We shrunk the exhibit design process (concept to floor) from 2 years to five months. We engaged with hundreds of creative folks around the world who developed about 50 virtual exhibits, of which seven were created in real life. The resulting (real) exhibits are high-quality experiences that reflect a level of creativity that could not have resulted from our scant in-house exhibit development staff. We inspired a community and got real results. But it wasn't all rosy, and we weren't perfect. Here are my top ten lessons from The Tech Virtual experiment with regard to design exhibits with a community of amateurs. 1. Give away the fun (and easy) part. We did not ask people to design whole exhibits and hand over CAD drawings so we could build them. Ultimately, what The Tech Virtual community contributed was great ideas for exhibits. Some museum pros have been puzzled by this. One exhibit designer told me, "we never seem to lack for good ideas. It's the execution of them as good exhibits that's the challenge." Exactly. If good ideas are easy to come by, why not let other people contribute them and focus our time on the hard work of execution? I think the reason we hold onto the idea generation part is because it's fun, not because it's the activity in which we have the most specialized expertise. This is not to say that the virtual designers didn't work hard to make their ideas in-line with our museum goals--in fact, we could have given them much clearer and stricter criteria and they would have thanked us for it. Our job was to provide a structured environment in which to develop ideas and the expertise to build the best of them. We certainly did the latter but only learned about the importance of the former late in the process. 2. Level the playing field or tip it in their favor. People who work with non-professionals on participatory projects often talk about finding "neutral" sites for meetings or meeting on their (the non-professionals') territory. In Second Life, I am not an expert--but many of our virtual exhibit designers are. Not only was Second Life a comfortable, familiar place for them to engage, it was a place where my authority as the museum exhibit designer came down a notch and we became individuals bringing different skills to the table. 3. Contests are good for raising awareness and focusing behavior, but not good for building sustainable communities or work in a flexible environment. We awarded $5000 to each exhibit design that was translated to real life. Doing so meant we could raise awareness very quickly (because everyone loves to blog about a contest), which was useful given the short time frame. It also focused the experience. People weren't coming to The Tech Virtual to muse about exhibits; they came to build exhibits on a deadline for submission to the contest. However, the contest also prevented us from legitimately fostering collaboration. People were unsure whether they should go it alone (and try to win the whole prize) or team up with others. We had several community discussions about the competition disincentivizing collaboration--the money sent a contradictory signal to all our talk about sharing. Also, because this was an experiment, parameters and criteria kept changing throughout the process. That's ok for a community project, but very frustrating (and for some, blatantly dishonest) in a contest. 4. Trust is essential, especially in a changing environment. As mentioned above, we were doing an experiment which necessitated changes and flexibility. But this was an experiment with human subjects. When we changed something, we were changing it on people. We had to be honest with them (and express our own personal frustration at changes we could not control) for this to not be a disaster. Had we held onto an authority voice rather than presenting ourselves as individuals engaged in the project, people would not have been willing to weather the storms with us. 5. It's important to have a way for folks to build their exhibit ideas. Some museum professionals asked me, "couldn't the participants have just described their exhibit in text?" While requiring people to build their virtual designs required more work (and expertise) from them, it also allowed them to clearly articulate their designs and to engage on a more professional, specific level about the exhibits. The point of Second Life is to lower the barrier to build things--things that move, things that make sounds, things you can explore (like exhibits). When you build something, it serves as a good launching point for discussion about what's missing and what the essential strengths of the exhibit are. It's easier to talk about interactivity by asking, "what can I do here?" than by talking in suppositions. It's also standard practice in community arts programs. If I ran a poetry or drawing workshop, we wouldn't critique participants' ideas for poems or drawings. We'd talk about the work itself. The same thing applies to exhibits, but Second Life is a tool that facilitates making the exhibit in a more accessible way than full-scale fabrication. 6. Second Life was a better community space for The Tech Virtual than the Web. The Tech Virtual was launched as a two-platform system: a website and a Second Life island. The website serves as a simple social network and exhibit proposal holding place, enabling people to propose projects, join exhibit teams, and comment on each other's work. But we quickly found that the website was a support platform for the exhibit workshop in Second Life, not an equal partner. I think there are three reasons for this. First, on the website we had to create any community from scratch, whereas with Second Life we entered a world of established communities. This is similar to the issue many museums deal with of whether to engage in established social spaces like Flickr, Youtube, etc. or to start their own. In our case the "start your own" component of this project was much less successful than jumping into Second Life. Second, Second Life was fundamentally a more social space, since one of its most powerful elements is live presence. We could hold workshops, meetings, and support informal conversations among participants and learned that this real-time engagement with others was a huge motivator for increased participation. Finally, as explained in #5, Second Life was the place where people could actually build their ideas, which became the key element in the development of an exhibit. 7. It's more important to have social instigators lead your community than authoritative professionals. Community management staff need not be curators or exhibit designers. They are more like floor staff or educational program staff--energetic, social communicators who are comfortable in the environment of your community space. We lacked this staff member, and made up for it with a group of wonderful volunteers and an amazing intern, Sarah Cole. In Second Life, our level of participation was directly proportional to the number of Tech staff social engaging with others via workshops, tours, and informal discussions. 8. The community provided great exhibit inspiration but their projects required heavy translation to become real exhibits. We learned early on that the elements that make for fabulous virtual exhibits are overlapping but not identical to those that make fabulous real exhibits. In the beginning of the project, The Tech's director would speak about "copying" exhibits from Second Life to real life. We quickly realized that this was unrealistic, both technically (no way to export Second Life models, different physics than in real life) and conceptually (modes of interaction are entirely different in Second Life). Once we realized that virtual exhibits would not translate directly to the real world, we transitioned to a model where the real exhibits were "inspired by" the virtual. In all cases we chose superlative virtual exhibits in which the core idea was powerful enough to transcend platforms. We maintained that core idea in the real version of the virtual design, and tried as much as possible to retain other aspects of the virtual designers' goals in recreation. The negative side of this is that no one (and it should have been a Tech staff member) was providing a heavy content overlay to the experience. We were too open in structuring the initial call for ideas, and then too rushed and focused on building them to develop a serious interpretative overlay with strong educational outcomes (something that The Tech would like to have in all exhibits). 9. There are many ways for creative amateurs to be involved in exhibit development. The above points may make it sound like the virtual designers only contributed ideas. In four of the seven real exhibits, they also contributed content and expertise. Three exhibits feature original art and music by the virtual designers, and (overlapping) three relied heavily on the technical expertise of the virtual designers. They enabled our engineering and fabrication team to push beyond our in-house capabilities to tackle some exhibit components and or content elements that we could not have produced in this timeframe. We also branched out of the virtual-to-real process to solicit amateur content. One of the exhibits features video of original paintings being created. To produce that content, I put an ad on craigslist and invited artists down to The Tech to be videotaped while creating art. One of these artists, a graffiti artist named Dan, had such a good time that he a. came back with some friends to do more graffiti for us, and b. came to the exhibit opening and was pretty overwhelmed with excitement to see his piece in this real museum. 10. There is nothing like the feeling of sharing and giving to others. I saved the hippie stuff for last. It was AMAZING to have all of the virtual exhibit designers here for the opening to see the real product of their virtual work. Dan wasn't the only one who was thrilled to see his work at The Tech; I had hallmark moments with all of the virtual designers. They made me cry with their enthusiasm and gratitude. Usually, you feel motivated to build great exhibits for your visitors. You leave the opening dazed, relieved, and happy to see people enjoying the pieces. But in this case there was the added layer of connecting with people who felt like old friends, returning the gift of their good ideas with the gift of good exhibits. I think we made a high-quality exhibition product with all of these virtual designers, and that's my number one criteria for feeling that this was a success. But just because the "feel good" stuff isn't primary doesn't mean that it doesn't exist. Yes, you can build wonderful exhibits with people from all over the world. But you can also build a community at the same time, and that's pretty powerful as well. All of the exhibits in this small gallery have tentacles out to people all over the world who helped conceive them. And that makes this little experiment feel pretty big. There is a typo in the link The Tech Virtual Test Zone. The last part of the path should be "testzone" instead of "zestzone". Here is the correct page. I was one of the exhibit design amateurs who was lucky enough to stumble on The Tech Virtual Test Zone and ultimately have my idea move from the The Tech Virtual in Second Life to The Tech in real life. 1. 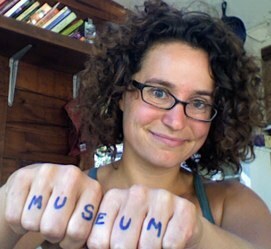 Give away the fun (and easy) part: You museum professionals only make it look easy. It's not. It is great fun! But for those of us who've never thought about creating a museum exhibit, issues such as survivability on the museum floor and the problem of catching and holding the attention of a passing fifth grader in three seconds flat can be baffling. 2. Level the playing field or tip it in their favor: I think Nina's comments are squarely on the mark. Second Life is an abstract enough environment that the somewhat intimidating prospect of attempting to collaborate with an institution such as The Tech was made to appear possible. "After all, it's not real! It's just a cartoon on my computer screen and I could always just turn it off." (Not really... but I told myself that more than once). 3. Contests are good for raising awareness and focusing behavior, but not good for building sustainable communities or work in a flexible environment: Again, I think Nina correct. I certainly was more motivated by the prospect of seeing my project on the museum floor than by the prize money. (Although that didn't stop me from cashing the check). But then, I live near The Tech, and the prospect of achieving Super Hero status with my nieces and nephews who visit The Tech with their school classes was a powerful incentive that would not have motivated entrants from Canada, the UK and Australia. 4. Trust is essential, especially in a changing environment: True, but I think we would have welcomed a slightly heavier authority influence on the part of The Tech. As an amateur I was often bewildered as to what the requirements were, and it was only boundless encouragement from Avi (Nina's Second Life avatar) that prevented me from giving up more than once. 5. It's important to have a way for folks to build their exhibit ideas: Spot on! I built and threw away a half dozen exhibit ideas. Second Life let me try things quickly and easily. The ability to quickly have a virtual prototype almost working and then have an informal discussion with others about what needs to change is a much more productive development environment than trying to describe a concept in text. 6. Second Life was a better community space for The Tech Virtual than the Web. That's true, and I think it's because in Second Life people wander by your workspace. Having a stranger walk up and ask "what are you doing" and then seeing how they interact with your prototype is invaluable. When people wander to your page on a wiki you often never know it. In Second Life they're standing there. 7. It's more important to have social instigators lead your community than authoritative professionals: I'm not sure this would be true if the project parameters were more tightly defined. But for the newbie exhibit designer wandering aimlessly in the virtual exhibit design world it was certainly great to have someone hanging around The Tech Virtual workspace at all hours of the day or night. 8. The community provided great exhibit inspiration but their projects required heavy translation to become real exhibits: This is true to an astounding degree! The virtual exhibit I built could not exist in the real world. This nearly caused me to abandon the effort. The bigger surprise is that the real world exhibit cannot be fully recreated in the virtual world, due to limitations in the Second Life scripting language. 9. There are many ways for creative amateurs to be involved in exhibit development: It was an unexpected delight that Nina and the exhibit design staff at The Tech allowed me to be involved in the creation of the real world exhibit. From getting the first rough prototype working right through the final adjustments an hour or two before the opening reception, they were surprisingly willing to let an amateur participate in the process. 10. There is nothing like the feeling of sharing and giving to others: Amen! Simply put, this was an unforgettable experience. Thank you Nina! You can learn more about the exhibit Nina and her team let me help create on the Studio San Jose web site. First of all, congratulations to the newbie exhibit developers, and congratulations to the Tech (and you, Nina) for taking this all the way. Great job!! small exhibit for a nonprofit called Ruckus Nation. This was an international competition where the nonprofit (HopeLab) sought product ideas from the public to "get kids moving", i.e., fight obesity. The challenge they have now is figuring out how to take those ideas and turn them into real products (which they are doing with the help of a product design firm). The idea that won the competition may not, in the long run, be the best idea for a product, as it turns out. As an exhibit developer, I'm constantly pushing and being pushed to develop exhibits + programs which will involve the public in a "2.0" manner. The process for developing exhibits themselves is a collaborative and distributed effort in my world. For me the takeaway from this exhibit was not that the public at large will always have better ideas than I do (some would disagree with that, I'm sure). It was the fun both the institution and the public had in creating new ways to engage with the public. I think this commitment to public engagement through any tool - online or in person, is what makes a cultural institution vibrant and alive, and the best thing the Tech could do as it embarks on it's reinvention. I think this is a really great step forward in changing the way we think about, and practice, exhibition design - well done to Nina and the Tech, and thanks for sharing. I've a question about the collaborative nature of the initiative: in the manner of 'crowdsourcing', did the programme allow for exhibit designers to modify the designs of others? If not, might this be considered for the future and how might exhibit designers feel about this? The key that seems to make open-source software development work is the ability for developers to take the 'best' parts of another designer's work and improve upon it. Could the same model work with exhibit design? Yes, we did have some collaborative re-design, and for some people the experience was really positive and useful. There was at least one person who left angry that people had "changed her idea" and the teens we worked with in particular felt very proprietary about their work. The prize/contest component didn't help, either. In my experience, (professional) exhibit design teams are often incredibly collaborative and relaxed about changing each other's designs. When working with amateurs, there has to be a complete trust and level playing field before participants don't feel like you are strong-arming them into change that you, the "expert," recommend.